Outlook.com Hotmail Extract Email Data Software can extract data from Outlook.com/Hotmail emails. Unfortunately, this software only works with the Hotmail Inbox, no other folders. 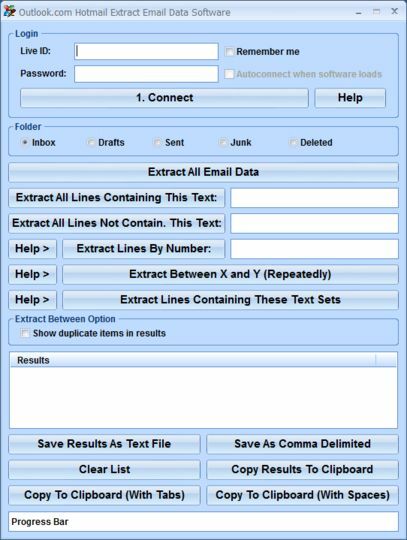 There are features in the software to extract all lines, extract lines that contain certain text, lines that do not contain certain text, extract characters between two strings or extract line by line number. The extraction results can be saved as a text file or copied to the clipboard. This software is useful to the power-user who needs to extract certain data (such as "only names" or "only zip codes" or "only phones numbers") over the course of many emails.